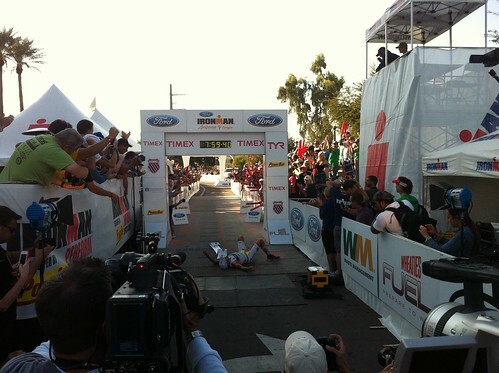 Did Hollie lay down at the IMAZ finish like Eneko Llanos? Tara Costa isn't the only Biggest Loser Iron-woman. I was browsing the standings from Sunday's Ironman Arizona and who did I see among the competitors? None other than Hollie Self, the season 4 contestant who ultimately lost in the finale to fellow black team member Bill Germanakos. That caught me by surprise. I had heard that Jay Kruger had Iron dreams (he finished Beach2Battleship, a full Iron-distance triathlon in October). I remembered Matt Hoover's attempt at finishing Kona. But I didn't know that Self was also boarding the Iron train and going longer than those appearances she's made with other former Biggest Loser contestants at the San Francisco Triathlon on Treasure Island. Had I been better about following the BL alums on Facebook, I would have known last month that Self was racing--it was posted right on her page and she asked for inspirational quotes a few days ago. The powerful mantras she received must have worked. Self got to hear Mike Reilly's "You are an Ironman" boom through the microphone last night. She finished the 140.6-mile race shortly before the clock struck midnight, crossing the line in 16:55:26. Congrats Hollie and we hope you're not inching around in pain today! Speaking of The Biggest Loser...when are we going to get another season? My Tuesday nights aren't complete without it--and I can't stand The Voice (sorry if you're a fan, but I prefer athletic challenges over voice ones). Looks like I won't have to wait much longer, the BL homepage says the next season starts January 6. Photo of Eneko Llanos after his 2011 Ironman Arizona win grabbed from runnr_az at flickr.